I didn’t have to wonder for long. The latest superfruit fad is Kakadu plums, an exotic fruit from Australia. It is said to be “a gift of the Dreamtime by Aboriginal culture.” Australia’s native superfood, Kakadu plums contain up to 100 times as much vitamin C as oranges. It is said to be a powerful antioxidant, antibacterial, and antiviral agent with anti-ageing properties. “Put simply, it is magic!” In my opinion, the only thing magical about it is the magical thinking required to believe the claims for it. The fruit can be eaten raw, but it is sold in many forms: as a juice; as a powder to be added to smoothies, breakfast cereals, and desserts; and even as face masks and scrubs. Its vitamin C improves brain function and fortifies the immune system. It contains phytochemicals (ellagic and gallic acids) that can be used to treat inflammatory allergic diseases, to kill cancer-causing cells, and to lower estrogen’s role in contributing to breast cancer. It contains trace minerals and antioxidants that nourish and invigorate the skin (vitamin E, zinc, iron, folate, lutein, and vitamin C). Vitamins C and E neutralize cell-damaging free radicals, preventing premature aging effects. It contains calcium needed for building bones and teeth and magnesium to help absorb the calcium. Thereby it guards against osteoporosis and other bone-related conditions. It is rich in dietary fiber, making it a natural cure for constipation and an effective weight loss food. Yurrku sells a day cream, 0.33 oz for $16. Lovingearth sells Kakadu plum powder and advertises it as “cane sugar free, gluten free, fair trade, dairy free, low GI, and vegan.” Gee, that must prove it’s good for you! Just add a teaspoon to a glass of water or juice. 50 Gm for $22.90. There’s even a dark spot corrector for $49.99 advertised with before and after pictures of a user’s décolletage. “A Fountain of Youth”? Reviews are mixed, with some customers saying it did nothing for them. You can grow your own tree: 5 seeds sell for $4.50. Actual trees will sell for $39.00 but are not yet available. Apparently Mary Kay tried to patent it but gave up. It contains a lot of vitamin C. So what? Are you deficient in vitamin C? Do you have scurvy? Is there any reason you can’t get the vitamin C you need from more readily available and less expensive sources? They say the vitamin C improves brain function; which brain functions, exactly, and how do they know? They say it fortifies the immune system; which of the many functions of the immune system does it fortify, how do they know, and what if your immune system is already overactive from an autoimmune disease? They say it can treat allergies and cancer and prevent premature aging; where is the evidence? They say it “invigorates” the skin; what does that even mean? They say calcium and magnesium prevent osteoporosis, but that’s only if you are deficient in those minerals, and the amount in the products is probably not enough to correct a deficiency. They say it works for constipation and weight loss because it is rich in fiber, but according to one product website, their daily dose contains only 1 percent of the recommended daily amount of fiber. In short, they make a lot of unsubstantiated claims, but there have been no scientific studies suggesting that eating Kakadu plums or products derived from them would have any impact on health. I just don’t “get” the concept of superfruits. I see no reason to add superfruits to a diet that is already nutritionally adequate; it would certainly be foolish to eat them and use that as an excuse to skimp on your diet. But I can’t deny that superfruits are healthy for the sellers’ bank accounts. Just when I thought superfood silliness had reached its peak, NPR announced another new potential superfood: cockroach milk. It seems there’s a Hawaiian species of Pacific beetle cockroach that gives birth to live young and feeds them with a pale, yellow liquid “milk” from her brood sac. It turns into crystals in the embryos’ guts and is time-released. A researcher in India analyzed it and found that it is one of the most nutritious substances on Earth, rich in fat and protein, contains all the essential amino acids, and is three times richer in calories than buffalo milk. And it doesn’t taste of cockroach; it is tasteless, at least according to the one individual who has ever dared to try tasting it. But the researcher warned that there was no evidence that it is safe for human consumption. And it’s hard to milk cockroaches, so he has sequenced the responsible genes and is trying to genetically alter yeast to produce it. Don’t worry; no one is trying to sell the stuff yet. I can’t help but wonder if some enterprising marketer will capitalize on this news by grinding up cockroaches and trying to sell them to gullible customers. 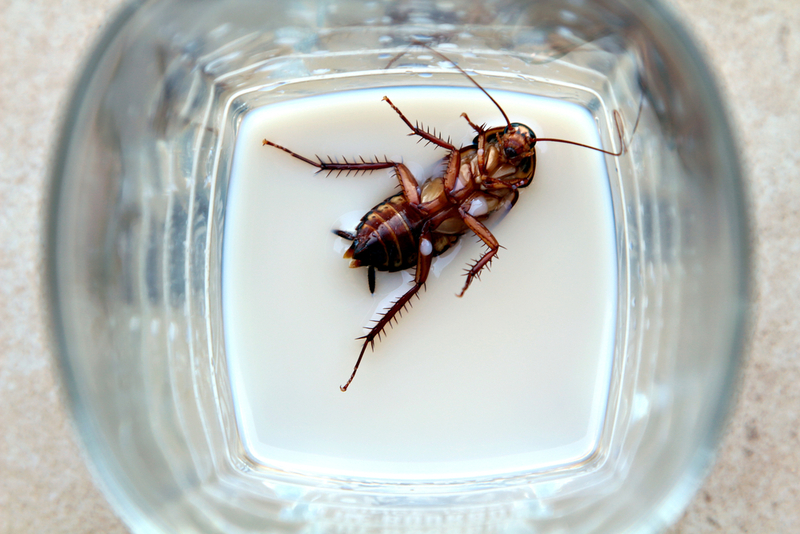 The yuck factor might interfere with marketing even if real or fake cockroach milk becomes available. While researching this I learned a new word: katsaridaphobia, fear of cockroaches. While not exactly afraid of them, I’m definitely intolerant. I’m not willing to share my home with them. When I lived in Florida I got very irritated when one of them ruined a glass of champagne by drowning in it when I left it unattended for a few minutes. I guess I should at least give them credit for having good taste; I never found one in a glass of water.